The youth of Redeemer Church have had a lot going on this summer! But undoubtedly, the highlight of all the activity culminates with Vacation Bible School and Summer Camp. For the elementary aged kids, VBS is an all-engaging submersion experience held right here at Church. The theme of this year’s VBS was “Cave Quest” and a number of volunteers came together to transform our church halls into an imaginatively stimulating cave exploration experience. Our Jr. High students loaded up and trekked their way to Thousand Pines for a week-long camp of fun, games, and chapel; while our High School students traveled to Forest Home and threw themselves fully into all the wild, weird, and life-transforming experience of camp. We thought you might enjoy looking through a photo journal chronicling the summer experience of VBS and Camp. So enjoy these snapshots of the precious kiddos we are raising in our church…(some of them very nearly adults now), complete with snippets shared by the leaders of these events. Tell us about a memorable moment that happened during your week of VBS? Watching kids in all their team colors dancing and singing during worship was the highlight for me at VBS. They were having so much fun and learning to follow Christ at the same time. I also loved seeing the leaders’ faces light up with the kids as they laughed at themselves. Some leaders have mentioned to me that they already miss their group. Each of them have such a unique bond! There were so many people working hard alongside the kids and behind the scenes to make this week happen. I got to see a glimpse, or microcosm, of how the body of Christ functions in unity. 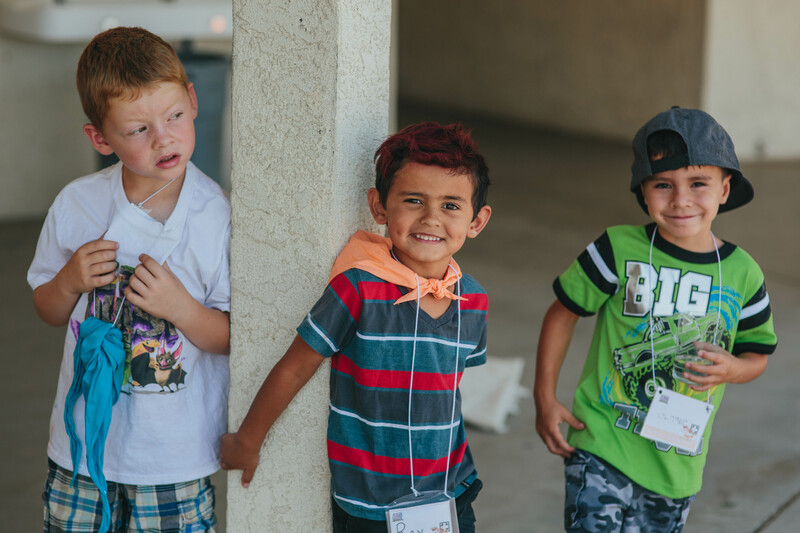 Every person who volunteers is gifted with a particular way to minister, and at VBS it was affirming to see these dedicated people scatter into their various positions and make it happen. In the Kid Vid room, the leader was talking about how we try to move closer to our goals in life but sometimes things happen that sidetrack us from what we have envisioned. A little girl raised her hand and said she wouldn’t worry because God is moving us closer toward His goals – so insightful!! I wish that we, as adults, would remember His sovereignty and be comforted by that too. I could not believe how much money was raised by these kids in one week for the kids we sponsor in Kenya! They brought spare change every day and were so excited to bring canned items for our food pantry as well. This made me think about how quickly a little bit of help from many of us can cover a huge need. Any funny stories from VBS? Who didn’t love watching Adrienne get a pie in her face?! She and the pastors were great sports about it. That was a hilarious finale to a week of fun and meaningful discipleship. And a special thank you to all our VBS volunteers who helped make this event truly memorable for our kids! If I had to make a list of things I learned at camp, it would be this: patience is key, camp Corn Dogs are always undercooked, teenage boys don’t shower, and most important of all, I have, by far, the best group of guys I could ask for during my internship here. This verse was the main theme of high school camp this year. Those who have been saved by grace through faith are on display to the world as God’s handiwork or masterpiece. He is our maker and what a beautiful craftsman he is! This week was a powerful reminder that God’s work in the world is done predominantly through his people. While he doesn’t need us for anything, he uses us for everything! When you begin to consider that all people reflect some of God’s creativity and we all share a common bond in existing as spiritual beings it changes the way you live. This week at camp we were challenged to view others and ourselves in this light. The proper response then is all out worship of Christ in our everyday lives primarily through loving others in humility and grace. What a great foundation for a new season of youth ministry at Redeemer! To everyone who has invested in these kids and their leaders this summer through donations, volunteering, and prayer, thank you! Hope you’ve enjoyed this photo journal of Redeemer Church’s Youth Highlights 2016.